Ten-year-old Margaret, dressed in a pink frock, smiles proudly from behind a eucalyptus tree. This tree — and the new forest of seedlings behind it — was, after all, her idea, her opus! 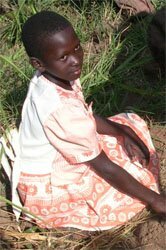 Margaret is assisted by ChildFund (CCF)-Uganda and lives in the Kiboga District, which is located in central Uganda. She dreams of re-establishing the old forests that were once characteristic of the community — a lush place that existed before Margaret was born. She and other village children have never seen the “forest beauty” that the elders lived in and called home. Margaret’s words should not be taken for granted. Once a beautiful greenbelt dominated by natural forests and grassland swamps, Kiboga is no longer as beautiful as its former self. Kiboga District is one of the major charcoal and firewood supply centers for Uganda’s capital city, Kampala. There are more charcoal- and firewood-loaded trucks than passenger vehicles passing on the road through Kiboga. With this constant reminder of the forest’s destruction humming in the background, the Masodde program community staff and children have embarked on a campaign. In Margaret’s words, it is a campaign “to cover Masodde green again.” With the children leading the way, the entire community is compelled to make a change and bring back some green and foliage to the landscape. The trees and their below-ground roots will further prevent drought and soil erosion. 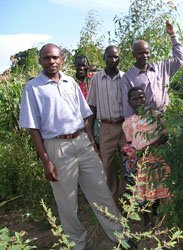 Margaret and her friends offered a tour of the newly sprouted plots. The children told the visitors not to pick or break any leaves from the trees, not to run around in the tree garden and to walk within straight-line gaps between the lines of trees. Children in the Masodde program community, together with adults, have planted 10,000 eucalyptus trees and 5,000 pine trees on land that was once uncultivated.